Mary Katherine Baxter was born in Chattanooga, Tennessee. While she was still young, her mother taught her about Jesus Christ and His salvation. At the age of nineteen, she was born again. 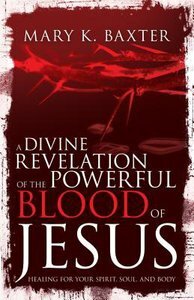 In 1976, while she was living in Belleville, Michigan, Jesus appeared to her in human form, in dreams, visions, and revelations recorded in her books A Divine Revelation of Heaven and A Divine Revelation of Hell. During those visits, He revealed to her the depths, degrees, levels, and torments of lost souls in hell, telling her that this message is for the whole world. Since that time, she has received many visitations from the Lord. In God's wisdom, to give balance to her message, she has also received many visions, dreams, and revelations of heaven, angels, and the end of time. Mary was ordained as a minister in 1983 at a Full Gospel church in Taylor, Michigan. Ministers, leaders, and saints of the Lord around the world speak very highly of her and her ministry. She has also authored Divine Revelation Of Angels; Divine Revelation Of Deliverance; Divine Revelation Of Healing; Divine Revelation Of Prayer; Divine Revelation Of Spiritual Warfare and Divine Revelation Of The Spirit Realm.